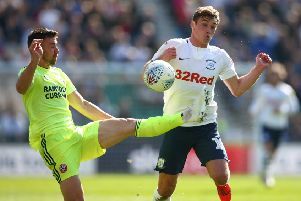 Sheffield United moved back up to the second automatic promotion spot on Saturday with their 1-0 win at Preston North End. Here’s how Richard Sutcliffe rated their individual performances. Sheffield United's David McGoldrick (left) and Preston North End's Jordan Storey in action. Henderson 7 - Fine save denied Robinson in the opening quarter, the Blades keeper getting down smartly to his right. Displayed good handling all game. Basham 8 - Reads the game so well. Tremendous determination at the back when Preston were putting pressure on the visitors. Charged forward as and when possible, before being permanently moved up the pitch in the rejig that saw Richard Stearman brought off the bench. Egan 7 - Helped created the opening goal by finding space in the six yard box to meet a corner. Typically resolute at the back. Stevens 8 - With Jack O’Connor unavailable, he was moved into the back three from his usual position of left wing back. Performed well before moving back to his preferred role when Cranie came off the bench. Wasted a great chance to make it 2-0 when fired over. Baldock 7 - Proved a threat when getting forward down the right flank. Norwood 8 - The heartbeat of the side. Even when Preston were enjoying the better of things in the early exchanges, Norwood was winning plenty of midfield tussles. A cool head when the pressure is on. Duffy 6 - Unable to provide his usual telling contribution in the opening 45 minutes. More involved after the restart and fired over after a surge upfield. Substituted. Fleck 7 - A bundle of energy in the United midfield, linking neatly with his team-mates. Threw himself at a shot from Robinson just before the break when the Preston man looked to have a clear view of goal. Sharp 6 - Much more involvement after the break, the Blades captain being denied by a fine save from Rudd. Substituted. McGoldrick 7 - Broke the deadlock by being alert inside the six box to capitalise on goalkeeper Rudd only being able to turn Egan’s header on to rather than over the crossbar. Cranie (for Dowell 63) 7 - Stepped into the back three in typically solid fashion. Stearman (for Duffy 77) - Brought on to shore things up. Hogan (for Sharp 83) - Helped see the game out.